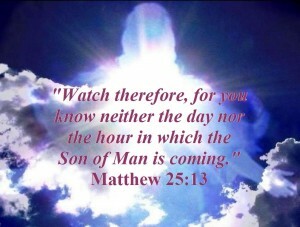 Who will be on watch when the Lord comes? Ticking time. Who is watching? Time seems to be elusive. We age, our children are “suddenly” adults, and our parents become cherished memories. When did it all happen? Who was watching? It can happen in a moment—even though it was a decade. It can occur when we aren’t watching. Likewise, the coming of Christ can take us by surprise, unawares, if we aren’t alert and ever watchful. Luke 21:34-36 (34) But take heed to yourselves, lest your hearts be weighed down with carousing, drunkenness, and cares of this life, and that Day come on you unexpectedly. (35) For it will come as a snare on all those who dwell on the face of the whole earth. (36) Watch therefore, and pray always that you may be counted worthy to escape all these things that will come to pass, and to stand before the Son of Man. Matthew 24:42 Watch therefore, for you do not know what hour your Lord is coming. 1 Corinthians 16:13 Watch, stand fast in the faith, be brave, be strong. 1 Corinthians 15:34 Awake to righteousness, and do not sin; for some do not have the knowledge of God. I speak this to your shame. When we are not vigilant in our watch, we can risk our own salvation– and the salvation of others who may be watching us. When we do not declare what we see and know about God and the coming of Christ and what we must do to prepare—we have failed as watchmen. We must each take care that we do not stumble, becoming our own Watchman, so that we are ready when the Lord returns. Ticking time. Are you watchful? Previous PostThe Right Time is God’s TimeNext PostJESUS NEVER CHANGES—BUT WE MUST!